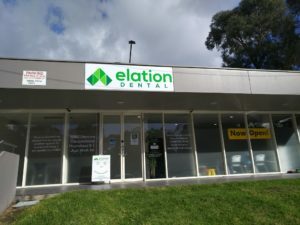 Elation Dental signage now installed on Bayswater Road and Eastfield Croads, Croydon South - Elation Dental: Best Dentists in Croydon South, Ringwood, Heathmont, Bayswater, Kilsyth and surrounds! 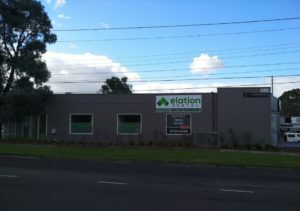 Elation Dental signage now installed – you can find us at 111 Bayswater Road, Croydon South! The installation of our signage confirms that there’s no longer a Network Video at Eastfield Shopping Centre. Elation Dental has been operating since September 2017. Elation Dental includes three amazing dentists – Dr Tina So, Dr Tim Wenas and Dr Madeline Townsend, plus Mr Jeremy Kearns (dental prosthetist). Taylah is our fantastic dental assistant, with Sally often coming in to help on reception too. Elation Dental tel 9725 2029, or book online at www.elationdental.com.au! We are proud to offer first class dental treatment at very reasonable prices. Our fees are set at (or lower) than the average dental fees charged by dental practices in Victoria. We accept all local community centre vouchers (from Inspiro, Lilydale and other community dental clinics). These include Victorian Emergency Dental Scheme and Victorian Denture Scheme vouchers. All health funds are accepted, as we have HICAPS available to claim your benefit directly. We are also happy to welcome Dr Hill to 111 Bayswater Road, a longterm local GP who specialises in allergic diagnosis and treatment.